The 2016 Tony Awards celebrated all things Broadway last night in New York City* and this red carpet event has become one of my favorites. Mixing bold color with pattern was a big trend and Part 1 of this round-up is awash with dresses (and suits) of this kind. *While also touching upon the horrific violence and mass murder at a gay club in Orlando in the early hours of Sunday morning. Writing about fashion after such an event always feels somewhat glib, but the Tonys and musical theater has such strong ties to the LGBT community and this celebration shows the kind of inclusivity that theater offers. For a complete list of all Tony Award winners click here. Busy Philipps as Michelle Williams’ awards show date is one of my favorite traditions – ticks all those IRL bestie boxes- and both look stunning. Michelle Williams is wearing Louis Vuitton (of course) and her whole makeup/hair styling is very much like this 2013 campaign. As my own personal hair inspiration I am thrilled to see Williams going shorter again. There’s a whole lot of different florals going as you will see when you scroll and I love Philipps’ take in a strapless pink Ingie Paris gown. Busy Philipps also has an Olympia Le-Tan book clutch, which is on my ultimate list. Busy has Jane Eyre (can also see it here); I would love The Bell Jar. 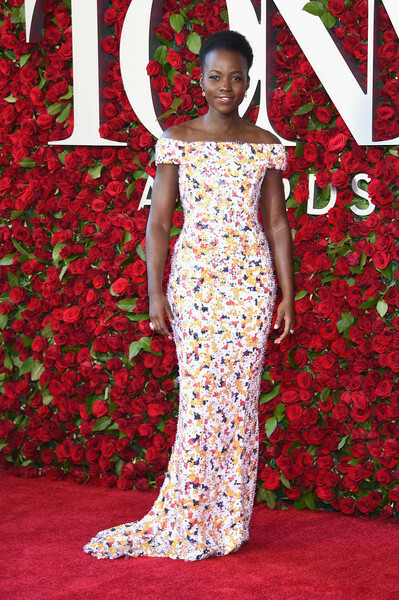 Another awards show red carpet triumph for Lupita Nyongo’o in a colorful Hugo Boss gown. Designer Jason Wu explained to Vogue that the look of the dress was inspired by Tetris; the sequins and 3-D textural effect is incredible. An emotional night was made even more so when Lin-Manuel Miranda delivered a sonnet that he had written yesterday in reaction to the senseless violence in Orlando. Part of the sonnet was also dedicated to his wife Vanessa Nadal and her bespoke Edie Parker Hamilton clutch is as delightful as her beautiful paint splattered looking frock, which I love. 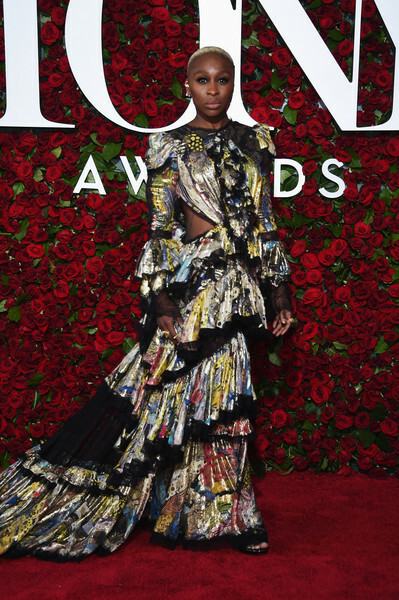 Keeping on the Hamilton track and Tony winner Renée Elise Goldsberry pairs two of the night’s big trends – yellow and botanicals – with great success in Oscar de la Renta. Plus pockets. More pale yellow delights and I wonder Alicia Vikander’s Louis Vuitton Oscar dress has led to a bump in this shade (a dress I liked, but didn’t love). I prefer both Goldsberry’s and Lucy Liu’s Zuhair Murad take on this yellow tone and the floral detail here also adds to the dreamy texture. Cynthia Erivo won for The Color Purple and crushed it on the red carpet in a show stopping Roberto Cavalli gown. There is a lot of dress to work with and Erivo doesn’t let it overwhelm her. Also a good reminder that this Tony actress roundtable is every 100 emoji worth of your time. 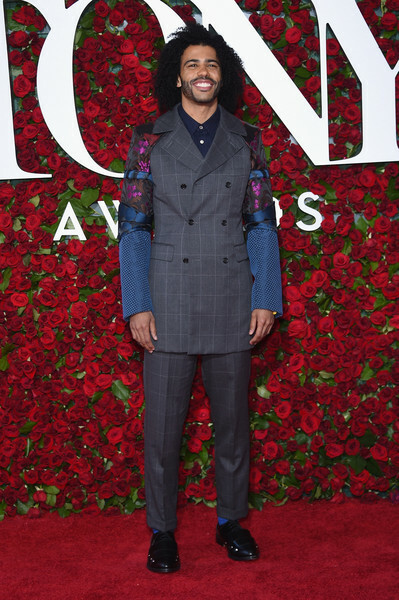 Daveed Diggs was another well deserving Hamilton winner and he took the guys suit game up a notch in Commes des Garcons. This patchwork/mixed texture choice is pattern clashing at its height and I think he looks great in a very hard to pull off look In the best dress worn by a supermodel category Joan Smalls takes the prize in sparkly Altuzarra. 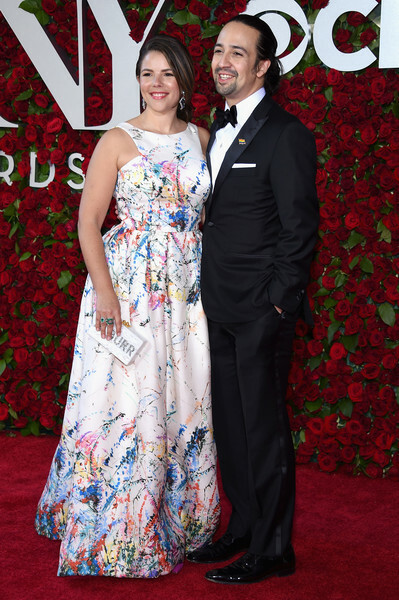 More bold florals from Oscar de la Renta from nominee Laura Benanti and the rose bush backdrop is working wonders with all of these colorful frocks. Rounding off Part 1 with another botanical stunner with Sophie Okonedo in Zac Posen combining long sleeves with strapless and a really interesting silhouette.